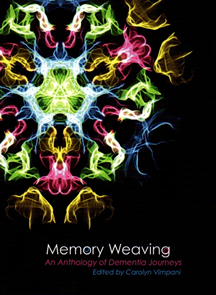 The threads of each of our lives are woven to form unique personal memories, out stories. With the onset of dementia these threads become tangled and frayed forming unfamiliar designs interwoven with strands collected from yesterday’s fragmented recollections and today’s confusing encounters. If you have or care for someone with dementia, you will find your own experiences in this anthology. If you want family and friends to understand the journey you and the one you love are making, give them this book!’ Edited by Carolyn Vimpani.